Seattle folks sometime feel a bit of an inferiority complex relative to the denizens of the Bay area, with some suggesting that the SF area has better weather. But the truth is that Seattle has better late spring/summer weather and this weekend is a good example. The Space Needle Pano Cam at 11 AM Friday shows blue skies and perfect weather conditions. Take a look at the visible satellite imagery Friday morning. Western WA is clear, with a some low clouds offshore. The Bay Area is all socked in. 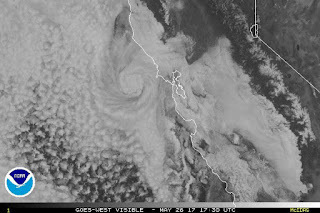 And there is a low pressure center offshore with spiraling cloud bands. Looks scary. The weather.com 5-day weather prediction for Seattle is forecasting superb conditions, with temperatures rising into the lower 80s for the entire weekend. 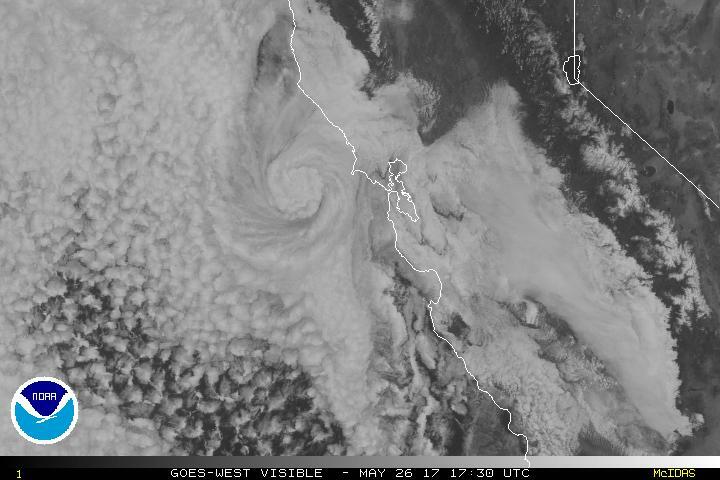 San Francisco has a bleak outlook, with highs in the lower 60S and lots of clouds. Depressing. I know what some of you are thinking....this is just one weekend. Does SF really have inferior summers? Well, lets look at the climatologies for both cities. Seattle's typical high temps (red line) peak in late July and August around 73F. San Francisco only gets into the mid-60s that time of the year. They have a strange annual temperature variation with their highest temperatures (only around 70F) in September...and this doesn't do them much good, since kids are back in school and folks have returned from their summer vacations. And now the shocker.... Seattle has MORE HOURS OF SUNSHINE than San Francisco in July and August. Don't bother looking at other months. I wish Twain had said that, as I have credited him with it many times. But, Cindy Lovell, former director of the Mark Twain Boyhood Home and Museum in Hannibal, MO and the Mark Twain House in Hartford, CT, told me he never said it. I was very disappointed. It's a great saying. Seattle definitely has San Francisco beat from the middle of May to the beginning of September, but San Francisco wins out the rest of the year. The transition from summer to winter isn't quite as jarring as it is here either. Every single time I've been there during the winter, there have been stretches where I was able to comfortably walk around in a t-shirt. That's not something I'm able to during the dead of winter save for a few instances - mainly during the more enjoyable winter of the blob. Don't conflate San Francisco with the entire Bay Area. Just cross the Bay Bridge and find much more sunshine in the East Bay. The hotter it gets in the Central California valley the colder it gets in San Francisco. Cliff is the 'blob' back? It's getting hot. Just go south of the SFO airport, and it's much, much better and more sunny. It's a whole different climate. Driving north into the airport area, you can see tons of low clouds banked up against the coastal range and north. Just drive into SF when you want to but live on the peninsula or east bay. I spent a lot of time in the East Bay and San Jose areas, and the weather there is far too warm and too sunny for my taste in summer. San Francisco is cloudy and cool like it should be. Give me a SF summer over a Seattle one any year. 65 is my upper limit for optimum comfort on cloudy days, and 60 on sunny ones. Which is another good reason (up here) to live along the Strait where it's cooler than Seattle in summer and drier in the winter. Win, win. This post actually sold me on SF weather. Temp in the 60's during July and August sounds heavenly! I've lived in the Bay Area and SF is indeed astoundingly dreary (and cold -- that fog is accompanied by a stiff breeze) in the summer, but as others have mentioned there's lots of microclimates there, almost all of which have warmer summers than SF. Oakland and Berkeley have in my opinion the best climate in that region: close enough to the Golden Gate to keep temperatures from getting too hot (and the air too smoggy), and far enough from it to allow it to get sunnier and warmer. Still, I missed the way the seasons turn up this way (I want fall to be distinctly cooler than summer, and like the occasional snowfall we get), plus the cost of living there is way higher, so I didn't stay. I was told it was Jack London who said that quote. Misleading facts. Seattle gets bareley more sunshine for 2 months. Yes california isn't as warm ad people think it is. But it is sunny and dry.